These are phrases that we declare to and hear from each other on a regular basis. No matter who you are and in fact, no matter how confident you are, we ALL fall victim to body confidence issues at one point or another and this is normal. We are all human and as we coexist, especially in an era of heightened social pressure, comparison creeps into our lives and we start to feel like we are not curvy enough, not skinny enough, not good enough. Personally, although I have achieved what I refer to as my ‘best body’, there are still moments when I succumb to social pressures and I start to feel…well…insufficient. I pinch at my lower belly, watch my thighs jiggle in the mirror and poke at the blemishes on my face only to then make unrealistic changes to my diet and exercise routine which end up making me feel unhappy. Yes, I am generally a confident person and yes, I LOVE my body. But that doesn’t mean that I never feel self-conscious. At least now, I can say I am much better than I used to be. Believe it or not, there was once a time when I would walk around, constantly sucking in my belly because I felt like it was too big. 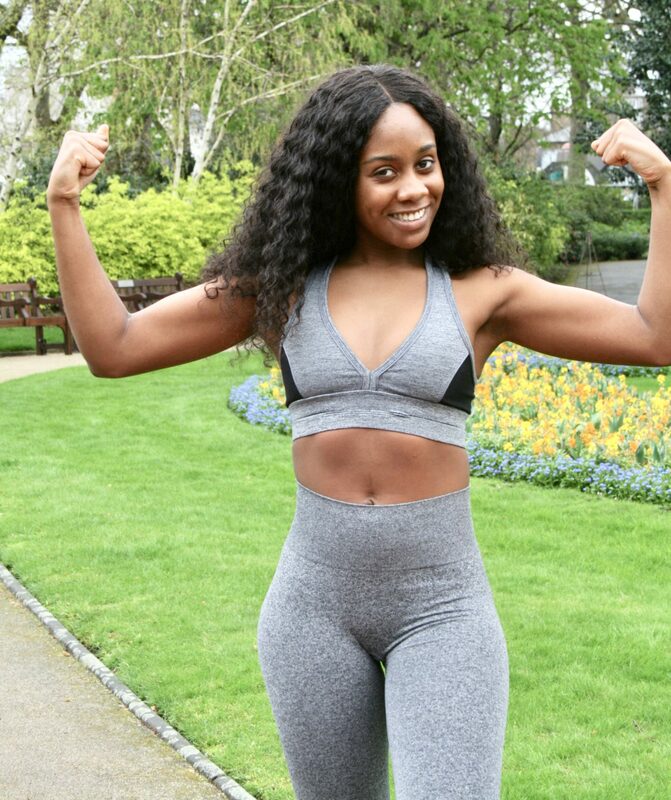 Even after the confidence boost and overall satisfaction I gained after achieving my ‘best body’ I still made it my mission to get a six-pack because I felt like as a fitness blogger, I had to live up to a certain image and this required me getting rid of what I saw as my ‘lower belly ‘pooch’. After watching hundreds of ‘blast stubborn belly fat’ or ‘get a six-pack quick’ videos from certified personal trainers I soon realised that achieving this goal would involve a lot of hard work, nutritional restriction and sacrifices that I found very difficult to make. I would follow the advice for a week then I would binge eat because my body and mind were not happy with the changes I was making. I also wasn’t eating the foods I loved because they were deemed ‘bad’ foods to eat when trying to get a six-pack. Then one day it hit me and I said to myself, ‘why can’t I just be satisfied with where I am now instead of trying to achieve UNNECESSARY and SUPERFICIAL goals?’ I had to remind myself about what achieving my ‘best body’ was about and about the moment I realised that I had nothing to be self-conscious about. I feel amazing, I am happy and I love my body! No, I don’t have the six-pack I desired all those years but honestly, I don’t need one. There is so much pressure in the world we live in to conform to a certain image of how our bodies should look. YOUR BODY IS YOUR BODY and if we were all meant to look the same, God wouldn’t have created such diverse humans. Who said having a flat belly or a six pack or toned thighs or perfect skin will make you happy in the end? Unfollow the pressure– Literally unfollow the people who make you feel like you are not good enough. People only show their best sides on social media and the full picture is guaranteed to not be as ‘perfect’ as you perceive. You hold the key to your happiness and sometimes, happiness is just a tap away. Remind yourself of your blessings- Count the blessings that you have. This helps you put life into perspective. Speak positivity into your life- Remind yourself daily about who you are. You are confident, you are beautiful, you are you. Direct your energy towards helping others- Helping other people enables you to gain a more positive outlook on life and a greater sense of fulfilment. Direct your energy towards doing what you love- Find a hobby to distract yourself from over-thinking. Have a supportive inner circle- Have a few people in your life that you can say are genuinely supportive and feed positivity into your life. Cut off the ones that breed negativity. Celebrate your “flaws”- Recognise that you are unique and celebrate the features that make you distinguishable from everyone else. You are special. You are more than just your physical features. YOU ARE YOU AND THAT IS ENOUGH. I hope you liked this post! Thank you for reading about my personal struggle with negative body image issues and feel free to share your story with me or in the comment section below so that others may feel inspired and uplifted. ⟵LIGHTER GHANA SALAD IN A JAR!